A funny silent film that is completely experimental and unlike anything ever seen before in modern film history. A very entertaining movie, this film is brave in ways that most movies of today would never dare to be. A movie today is considered brave if it turns back the clock to be filmed in black and white. The Artist goes even further and is actually a silent movie. Not only that, but it’s a silent movie about silent movies and about the change over in film history from those movies to talkies. The film is about a star of silent movies that now has to deal with the change. It’s very witty and fun. The movie definitely gets dark toward it’s end, and maybe goes a little too far with that, but otherwise it’s a pretty great film. The Artist has got to be the most experimental film in decades. Avatar was pretty out there too, but motion capture had been done before, just not for that length of time. What The Artist does, however, is completely original. It gives us a real silent film. A movie that is not just about the silent film era, but that is a silent film itself. It’s kind of like Kramer’s coffee table book about coffee tables, on Seinfeld. When was the last time we saw a movie that was silent from start to end (minus one or two small moments where there is brief sound), playing in theaters? And more important than just how experimental it is, is that it’s good. It’s smart, funny, and creative. In today’s age of comedies, movies often try so hard to be a little bit strange just so they can be funny, and hope to pull some laughter out of the air. Nine out of ten times, it doesn’t work. The laughs aren’t there and the characters are more stupid than funny. Whether it’s Ashton Kutcher trying to get Natalie Portman in no strings attached or Simon Peg, running around an office building like Mr. Bean in how to lose friends and alienate people, comedy is a tough genre to pull off. And for every bridesmaids or the hangover, there are tons of movies that don’t even come close. But in the silent era things were different. Because there was no sound, movies had to be witty in the situations they presented. I really noticed that here, in The Artist when the lead actress had a scene where she was trying on the actor’s suit jacket in such a way that she was pretending it was his arm in the jacket grabbing her while she stood beside it. The comedy was completely physical, and even if it wasn’t laugh out loud hilarious or anything, it was certainly creative and witty, and admirable for those reasons alone. Silent movies needed physical comedy and that means a lot more than just characters falling down or walking into things. Charlie Chaplin and buster Keaton were the masters, and The Artist is a love letter to the movies those guys used to turn out. The funny thing is that it isn’t a slapstick movie like what those guys used to make. Instead it is a sort of drama, with a sad, emotional story. Of course it’s a comedy, and so the dramatic moments are never anything too heart tugging, but the plot line takes a dark path, and that’s what makes the story so powerful. The story of The Artist is about the end of the silent film era. The star of the movie, George Valentin is a popular star of silent films and he’s a married and successful man. John Goodman plays the director of his films, and early on, a cute female fan that poses in a picture with him approaches Valentin. When Valentin’s wife sees this photo she’s not too happy, and there’s a very funny moment where Valentin and his dog both do the same apologetic head moves at the exact same time. Goodman tells Valentin that the age of silent movies is over. People want talkies now. Valentin refuses to change, and so he is fired from the studio. At this time, the female fan that approached Valentin early on, named peppy miller, is sending out headshots, hoping to make it into the industry. She ends up getting recognized and coming in right as Valentin is going out. He tries to make a silent movie on his own, without the studio backing, and it’s a failure. Now his wife (Penelope Anne Miller) leaves him, and he becomes a depressed, single man in a big house with nobody to talk to but his dog and butler. The butler / driver, is played by James Cromwell, and he’s great in the role as not only a loyal servant, but also a friend. As the movie goes on, things get darker and darker for our hero. He ends up losing his money and having to sell his valued possessions. It gets so bad that he even has to let his driver go. But Peppy Miller has been making it big all this time, and you can bet her path and Valentin’s are going to reconnect. This movie has a lot going on with regards to plot and the way that it’s pulled off is through dialogue cards that flash onto the screen, telling us what the characters are saying. It works out very well here, as the limited dialogue makes it so that the actors have to convey all of the feelings, twice as much as usual, with their faces. Imagine having no voice and having to convince an audience of things using only facial expressions. The movie is an emotional masterpiece. It has an enjoyable story, a lot of laughs, and some very good performances. I like that some big name actors like Goodman and Cromwell got involved, because this has got to be a great challenge for any proven actor, to now have to act without words or voice. 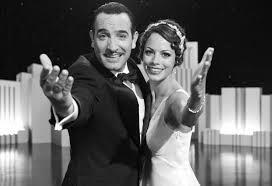 The Artist is a wonderful film. It is both smart and funny and extremely artistic.